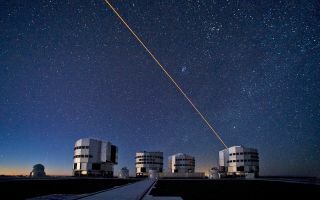 The ESO Very Large Telescope (VLT) during observations. In this picture, taken from the VLT platform looking north-northwest at twilight, the four 8.2-metre Unit Telescopes (UTs) are visible. In this space wallpaper, the ESO Very Large Telescope (VLT) during observations. In this picture, taken from the VLT platform looking north-northwest at twilight, the four 8.2-metre Unit Telescopes (UTs) are visible. From left to right, Antu, Kueyen, Melipal and Yepun, the Mapuche names for the VLT's giant telescopes. In front of the UTs are the four 1.8-metre Auxiliary Telescopes (ATs), entirely dedicated to interferometry, a technique which allows astronomers to see details up to 25 times finer than with the individual telescopes.